on tour show in Bath, UK on 13th December 2003. The Christmas edition of the Amiga CAM magazine (issue 11) is now available. Officer Fleecy Moss is now up online at Amigaworld.net. - AmigaWorld interview with Alan Redhouse. G4 system at two U.K. usergroup meetings recently (ANT on Sunday the 9th and SEAL on Friday the 14th). A report, photos and some video clips are now available on the SEAL website. - Screenshot of Warp3D running natively on AmigaOne. - More pictures, videos and a report from Benelux Amiga show in Rotterdam. - Video from Benelux Amiga show in Rotterdam. - Pictures from Benelux Amiga show in Rotterdam. At the show in Rotterdam, AmigaOS4 was shown running on the AmigaONE hardware. - Pictures from Pianeta Amiga show - AmigaOS4 running on the AmigaONE motherboard. At the Pianeta Amiga show, AmigaOS4 was shown running on the AmigaONE hardware. At the Amiwest event, Ben Hermans of Hyperion Entertainment provided an AmigaOS4 presentation. At the Amiwest event, Alan Redhouse of Eyetech participated in a Q&A session regarding the AmigaONE. At the OS4 tour event in Gothenburg, Ben Hermans provided a talk on the progress of OS4. new default intuition look and Font Anti-Aliasing. of purchasing OS4 for BPPC. Your support is very much appreciated in this matter. E3B are producing the "ALGOR" and "ROMulus" flashrom hardware. Quantum Leap has published some photos of AmigaOS4 and AmigaOneXE-G4 Demo. AmigaWorld.net: Francesco Z. 's short show report. An Amiga One XE G3 800Mhz with Debian Linux PPC and an Amiga 4000 with Os 4.0 beta are present and running at the booth of Virtual Works, Soft 3 and Bitplane. Also an ipaq with Amiga Anywhere is present and the last issue of Bitplane magazine is available. Attenders seems very interested about the Amiga One and the OS 4". in an issue of Club Amiga Magazine. how their order is doing - all that does is slow things up for everybody." in the March issue of Club Amiga Magazine. already asked questions here on our forums as well." Here is the first session of answers from Fleecy on AmigaWorld. firmware will be incorporated in the A1-XE boards which will be shipping shortly. which is currently under development by Hyperion for PPC based systems. 170 different graphics chipsets including all the latest offerings from industry leaders ATI, nVidia and Matrox. A full list of supported chipsets can be found here. ship. All these boards are fitted with the new Articia chipset (date code 0103)." Pictures of an AmigaOne G4-XE and the Dual 7410 CPU module are available at the Soft3 website. Amiga has published the first version of the feature set of AmigaOS4.0. - More World of Amiga 2002 pictures and show reports. DivX movie. Note this links to a large AVI movie, approx 600MB! - World of Amiga 2002 pictures and show report. Click here for Ian Stedman's show report. 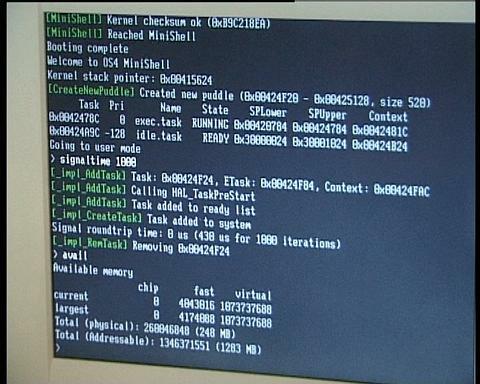 - AmigaOS 4 Kernel "ExecSG" demonstrated. - Amiga Executive update: November 2002. - Eyetech announce AmigaOneG3-SE and AmigaOne-XE Earlybird Systems. - AmigaOne PPC boot complete. PPCBoot project. Click here for further details. - Amiga OS4 status update. - Amiga Executive update: September 2002. - Amiga Inc: List of Amiga OS4 features updated. for OS4 has been updated at Amiga Incs OS4 website. - Photos from the meeting in Toulouse (France), June 22-23 2002. Photos 96 - 103: AmigaOne XE. Photo 68: AmigaOne XE CPU Module. - Please note that our postal address is changing. Refer to the contact page for new address details. - Amiga Executive update: Promotion Clarifications and Update. T-shirt and $50 off AmigaOne/AmigaOS 4.0. Prize draw also announced for numbered tiers of Coupon sales. and trade-in from G3 to G4 systems. - New screenshots from AmigaOS 4.0 released (HDToolBox replacement) - http://os.amiga.com/os4/. - ATI Radeon graphics card 2D driver for AmigaOS 4 to be developed by Forefront Technologies, Inc.
new Matrox graphics card: "It destroys the Geforce 4 completely. We've seen it in action already." the market now. The only that comes close is the P10 from 3DLabs". - The 68K emulator for AmigaOS4, Project Petunia, has an updated website with new benchmark figures. - 1st batch of AmigaOS 4 screenshots released - http://www.OS4.hyperion-software.com . - Bill McEwen of Amiga has posted a new status update at the Amiga website. Includes details of the new hardware, and OS4.0. - Eyetech have released the latest details of the AmigaOne project. required for the initial production run. PDAs, Cell phones, Set-Top-Boxes, Internet Appliances, Desktops, Digital TVs and more. - Small reduction of ImagineV5/ACUP/V6 credit card sales costs. Added EURO prices to the product ordering page. - Project managers of the AmigaOS4 updates, Hyperion Entertainment, have issued a status update. its new Chairman of the Board. New Warp3D with "Matrox, Permedia3 and Radeon1/2 support"
- Eyetech have released a status update on the AmigaOne project. for release on 1st November. AmigaOS PPC and AmigaOne motherboard scheduled for release on 1st November. Merlancia have obtained the rights to the Walker and MCC system designs. - ACUP status update: released maintenance update of the SARE submit tool - V1.1. - WarpJPEG.datatype v44.21 - PPC (WarpUp) JFIF-JPEG picture datatype update released. - Added updated S.A.R.E. archive to the beta section of the ACUP download area. This release includes an updated PPC render engine, and HTML documentation. Note: The old web and email addresses will remain operational. - Bill McEwen of Amiga has posted a Technical Update at the Amiga website. - TCP/IP stack - Brand new, written from scratch. - Resource tracking - Provided by the Amiga Component Model (ACM). - SMP - Will be in OS5. best audio people in the world working on it. GLIDE like low level APIs to really take advantage of Matrox cards. some bug fixes to the OS3.9 release. classic 68K applications will run under emulation. In AmigaOS 4.2, a fully integrated AmigaDE layer will be provided. AmigaOS 5 will include Memory protection. months. OS 5 will be available late next year. "A few weeks from now, a Psion notebook PDA running the Amiga DE will be released". (Amiga show) banquet by a representative of Eyetech. Later boards will have full ATX form-factor implementations." - G-REX 4000 PCI board: A new Riser Card Design has been created for the G-REX 4000 desktop version. - Matay will release a PCI board (named Prometheus) for the Amiga. chance of winning this great prize. - Warp* datatypes updated: Oliver Roberts has updated his JPEG, PNG, and BMP datatypes. Chapter 7 (Stage Editor). Also, Chapters 3 and 9 have been revised cosmetically. Archive available from the ACUP download server. - Updated electronic manual: Added draft version of Chapter 3 (Spline Editor). - Updated electronic manual: Added draft version of Chapter 9 (Project Editor). ACUP status report sent to the Imagine mailing list. some bug fixes to the OS3.5 release. Added LOTS of links to the "More Tutorials" area of the tutorial section. We wish everyone a Happy Christmas, and a prosperous New Year! site design, will be provided over the Christmas holiday period. Imagine in the software awards section, Click here. If you would like to vote for CADTech in the developers awards section, Click here. - Added QuakeGUI page to the products area of this site. - Amiga announce the release of AmigaSDK for Windows. purchase directly from Amiga's SDK page. outlines the benefits to software developers of using their Amiga environment. - Version 1.01 of the Amiga SDK for Linux has been released. - ppclibemu V0.8c - ppc.library emulation under WarpOS update. AmigaOS3.9 announced - specification details should be available from the Haage and Partner website soon. Eyetech will be producing upgrade systems for the A1200 and A4000 to give them an AmigaOne specification. This upgrade should allow the use of MAC PPC cards, as well as introducing PCI slots to the classic Amiga. - Voodoo CyberGraphX drivers announced for the G-REX PCI expansion system. implemented in the project submit tool. Issued to beta testers. - Added new tutorial (bin) to the tutorial section. not fully functional. Issued to beta testers. - Gary Peake of Amiga says that a Windows version of the Amiga software developer kit (SDK) will be out soon. - ACUP status update: SARE GUI updated. Queue list now functional, frame selector implemented. - ACUP status update: Added GUI, and general improvements made, to the SARE. Issued to beta testers. - Updated gallery and projects areas with new files. been issued to the beta testers. from your local Aminet mirror. Quake ports: Frank Wille, Steffen Häuser. clickBOOM will also be providing Amiga quake and these ports with their soon to be released game Nightlong. - Updated gallery, animations and projects areas with new files. multi-texture mapping, along with PPC support. - CGX 4.2 pre7 update released. (software development kit) will be at the big Amiga-Show in Neuss (near Düsseldorf) Germany. - Latest CyberGraphX V3 drivers are available from http://www.vgr.com/cybergfx/files.html. It is highly recommended that cgfx V3 users download this update. - ppclibemu V0.7e - ppc.library emulation under WarpOS update. on the support page of their website. V5.17 patch, and the V5.17a update). anticipated, a significant speed increase was gained with the PPC over the same test with a 50Mhz 060.
solution of using an alternative PPC compiler is in the process of being implemented. the public release of the V5.18 ACUP update will have to be pushed back a bit. - WarpJPEG.datatype v44.11 - PPC (WarpUp) JFIF-JPEG picture datatype update released. 3rd May 2000 - New beta release of Imagine V5.18 issued to beta testers. - CGX 4.2 pre6 update released. packages can be downloaded from the biz/cloan directory of your local Aminet mirror. - CGX 4.2 pre5 update released. - ppclibemu V0.7d - ppc.library emulation under WarpOS update. partnership designed to benefit both the classic Amiga, and the Amigas of the future. production of PPC accelerator and BVision/CVisionPPC gfx cards. - CGX 4.2 pre1 update released. - Executive Update - Feburary Executive Update. - ACUP V5.17 bug-fix added to the ACUP download server. to the stage editors goto-frame window. of the changes made for the V5.17 release. The V5-V6 GUI comparison and ACUP description pages will be updated to reflect this release soon.